Seymour, B., Getman, R., Saraf, A., Zhang, L. H., & Kalenderian, E. (2015). When Advocacy Obscures Accuracy Online: Digital Pandemics of Public Health Misinformation Through an Antifluoride Case Study. American Journal of Public Health, 105(3), 517–523. Although limited to an anti-fluoride Facebook case study I believe that the findings are also applicable to other anti-scientific movements like anti-vaccination and climate change denial. Here are some of the findings in the paper. 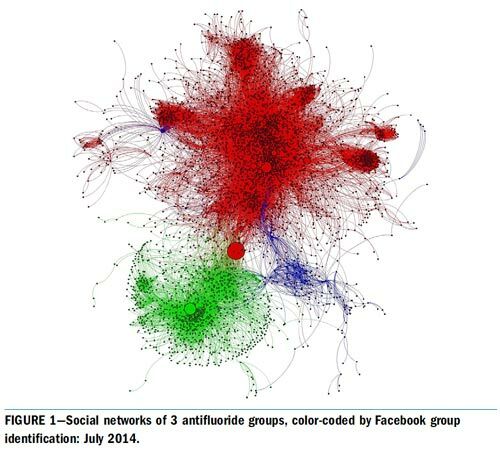 The connectedness within and between anti-fluoride networks was measured to get an idea of their social influence. Facebook “friend” connections between members within groups and between groups was very common and overall the study sample showed a significantly higher degree of connection than in Facebook overall. This is probably the result of group members having similar ideology or other traits leading to a desire to form social connections. Social influences lead to group shaping of individual attitudes and behaviours related to health and not reliance on expert findings. Although not detailed in the paper I believe that key sources of primary information for such social networks is very often articles in the “natural” health or alternative health magazines and websites which have already misinterpreted and misreported the scientific literature. Social media overriding traditional health communication? Now that minority ideas and behaviours have an online market they can spread through confirmation bias and the expanding social networks, and the strong ties in the networks reinforce the sentiments behind the spreading messages. Are there lessons here for pro-science groups? The findings of this research will strike a chord with sceptics and others who fight anti-evidence-based approaches to health online. They will easily recognise the social norms of such groups which leads to rejection of any attempt to inject a pro-science discussion. They will have experienced the put-downs and banning or blocking used to reinforce and protect those within-group social norms. Fascinating Ken. Did the study have a control group or (better?) look at pro-fluoride groups? 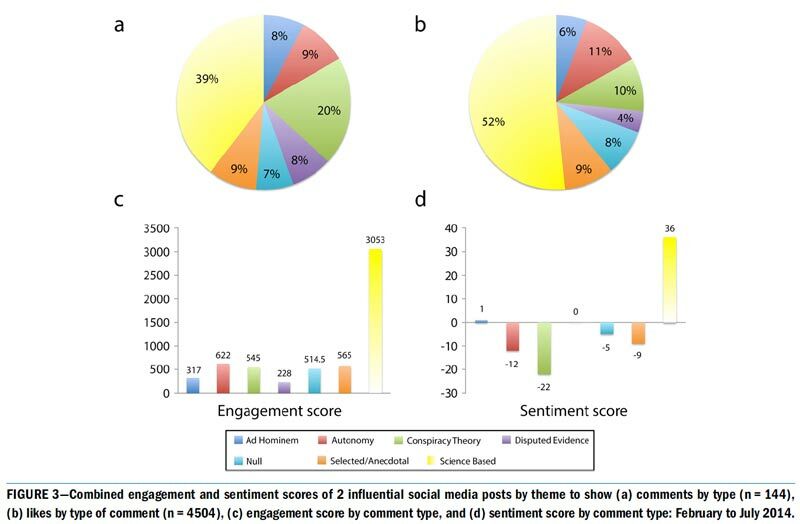 John, they compared connectivity for the anti-fluoride groups with connectivity for facebook in general and found a significant difference. They didn’t identify any pro-fluoride grouse – probably because until very recently there weren’t any. “Making Sense of Fluoride” which started up in NZ was a probably the first extensive such group. It is now more international so could be interesting to analyse. They could have done the same analysis for sceptic groups or similar which have been around for a while – such an analysis would be interesting. I suspect the results may have been similar for inter-connectivity – this after all is what strengthens such groups. From my own observations I would suspect that such pro-science group posts would have less degrees of separation from original science sources and the treatment of scientific comments would be far less hostile. I also susspect that originating sources for anti-fluoride groups are very often articles from “natural”/alternative health magazines and web pages (Dr Mercola?) who often misrepresent the scientific papers the sceptic group posts may more likely orginate from the original scientific paper.